I can’t remember exactly when it happened, only that I do remember that I fell madly in love with Gregory Peck as a kid. But I will bet a bag of popcorn I really developed my crush when he played Captain Horatio Hornblower in the movie of the same name. 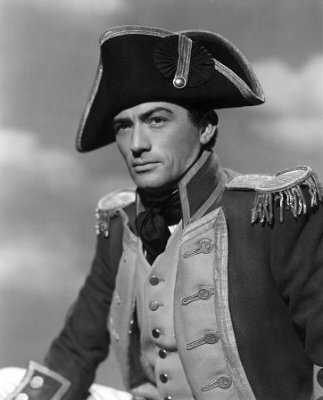 Set during the Napoleonic Wars, he was dashing, romantic, and smart. How I wished I was Virgina Mayo in that movie, except with dark hair and eyes. So what has all this little girl crush stuff have to do with writing you may ask? As a shy kid, old movies were my refuge and from them, I learned to become excited by stories, all kinds of stories. Stories I would never had heard of had it not been for Gregory Peck. I didn’t even know who the heck Napoleon was, except that he was famous and had to be defeated. And I realized that it is the lesser known warriors who often fall in death in such conflicts. With such a wide range of stories before me, it inspired me even more to tell my own stories. I also was inspired by my family who loved to tell them. When Gregoy Peck died in 2003, I did mourn– almost for the loss of a first love. It was not an unrequited love because he gave me so many good stories in return. Those I will remember, along with the awesome sight of Capt. Hornblower on the deck of his ship sailing ahead into an adventure I was sure to follow.